I’m in the midst of a Journeyman League. I must say that I’m having a great time playing in our local Warmachine/Hordes community. Tonight I played three excellent games. All fun, despite all the heart-wrenching moments….Ugh. 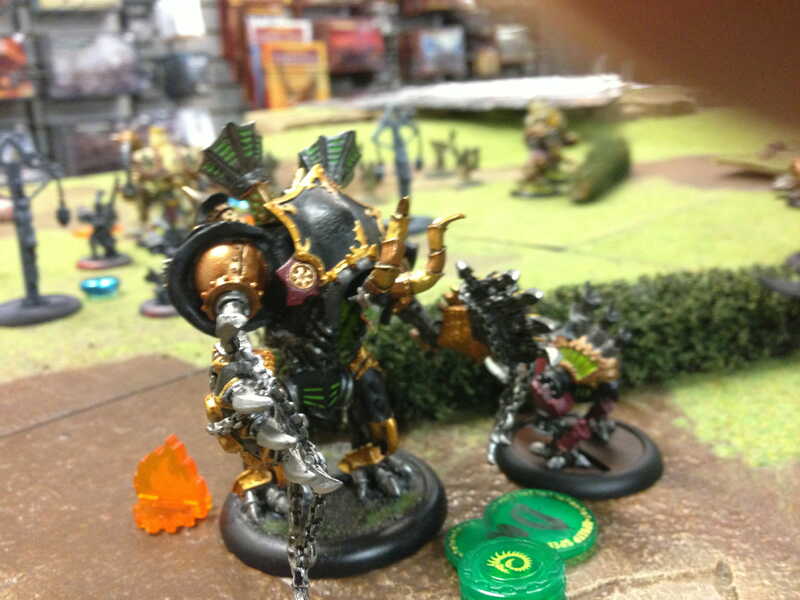 A Deathjack prepares to assault the Menoth forces….It doesn’t make it out of the game in one-piece. Trolls in the forest, waiting for their turn to execute a flank maneuver. 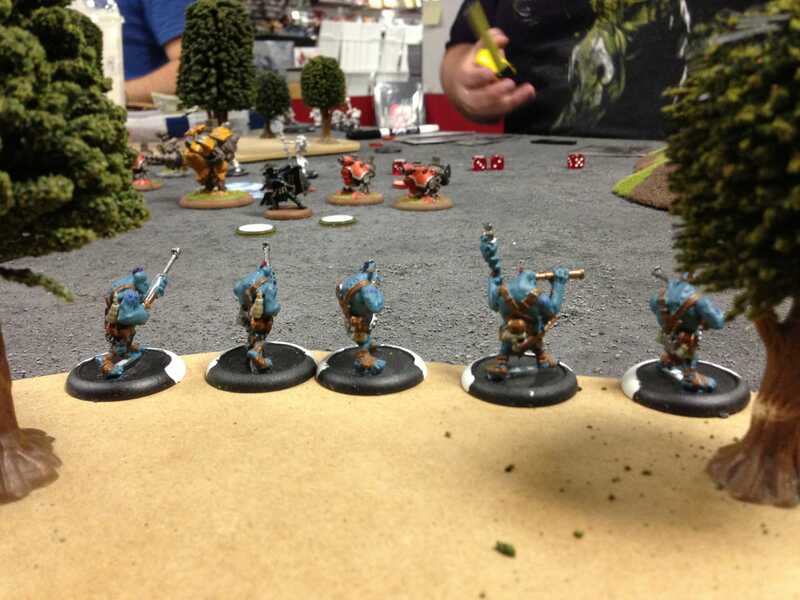 Warmachine/Hordes can be an unforgiving game. You might as well raise the white flag after one negligent activation, or forgetting to allocate focus, or popping your feat a turn too late. It happens to the best of us (maybe not so much to the veterans). I’ve got just over three years into the game, and I’m still learning. Through some serious effort and practice I’ve gotten rid of most of the sloppy errors. Now I’m working on abolishing that last 5-10% of crappy play habit. Alright… fine, 30%. I’m trying. A scene from the tree line reveals a furious pitched battle between the Mercenaries and Minion forces. Tonight was hard because despite winning my games, I didn’t feel I was playing well. Driving at night with no headlights, same deal, different situation. Part lack of sleep, or part distraction, in two different games tonight at our Journeyman League I forgot to either activate a model or activate in the optimal sequence for a turn. Solid rationalized planning doesn’t mean squat when they rely on a chain-of-events to pull off successfully. A broken link and it’s over, embarrassing sometimes. 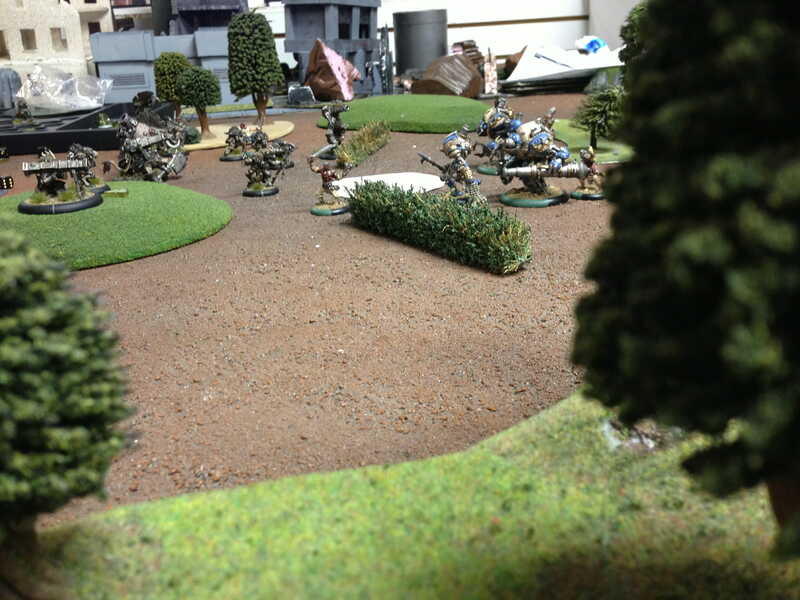 A vanquisher and repenter warjack stand ready behind a hedge linear obstacle. Facing a Cryx army isn’t something to sneeze at with a great opponent controlling them. This was a fun game….